Brick in the wall Written on June 25, 2009, by Ingeborg. 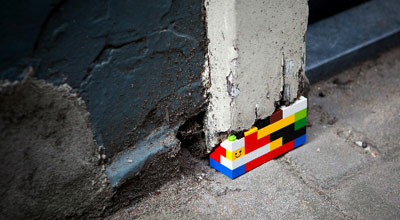 Jan Vormann quietly goes about his task of repairing walls one Lego at a time. I assisted him in Amsterdam. For him holes aren’t eyesores but opportunities to add colour to the city. The event is part of Platform21=Repairing, that investigates repairing as a way of thinking, a culture in itself almost, designed to cater to short term needs of both industry, politics and society.